The space under your elevated deck is full of possibilities! Who doesn’t love a bonus room or extra living and storage space? The endless possible uses are exhilarating! Just like the addition of a garage adds a potential bonus room above, an elevated or second-story deck creates additional outdoor living space beneath. This versatile space is more commonly referred to as “dry deck space.” With just a few extra steps it’s easy to make this unfinished space serviceable, thus expanding your outdoor living area for you and your family to enjoy even more. Whether you are considering adding a new elevated or second story deck or if you have an existing one, Archadeck of Central South Carolina can help you take advantage of the space below your deck, making sure you get the most from all your potential outdoor living area. 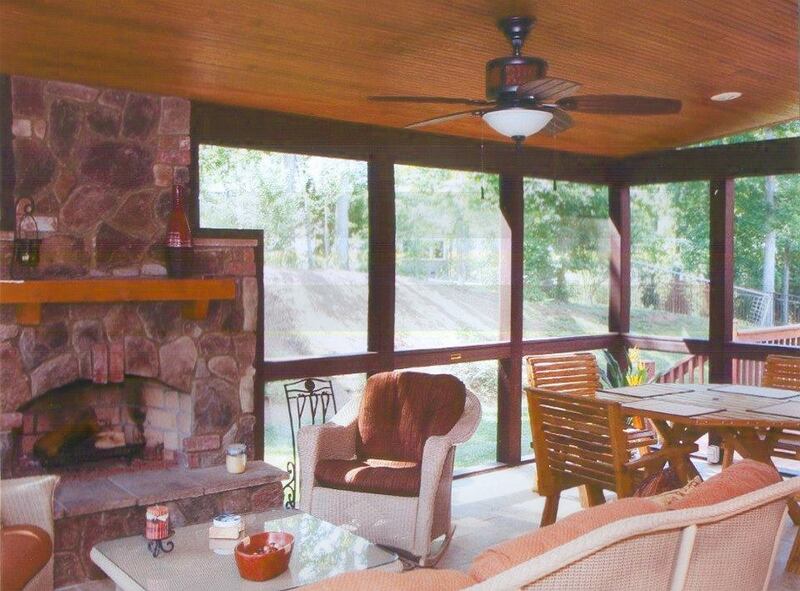 This elevated screened porch and deck features space underneath finished to serve as a covered patio. Notice how the area underneath the deck is dry while the rest is wet? Typically, the water dripping from the upper deck area prevents homeowners from utilizing the ample space below their second-story deck during rain. The spaces between the decking boards are the culprits, but there are several ways to make this space watertight for new and existing raised decks. Just imagine this bonus room as a paver patio or flagstone hardscape, a fully wired outdoor dining/living room with lighting, ceiling fans and high-tech electronics, a relaxing screened or covered porch, and even a protected hot tub area or much-needed storage space! This space turns the table of how we think of “dry space” with the screened porch underneath and deck atop — amazing! If you are adding a new elevated structure to your home and you know upfront you’ll be utilizing the space beneath, we have the ability to install a rain deck. 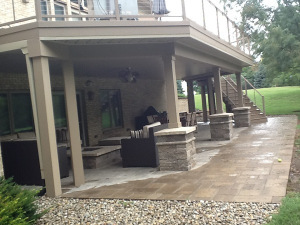 This entails multiple layers built within the structure with a slope to divert the rain and water away from the deck. The benefits of this component being layered within the deck as it is being constructed include a non-sloping ceiling for the room below and more flexibility for the addition of electrical accoutrements. 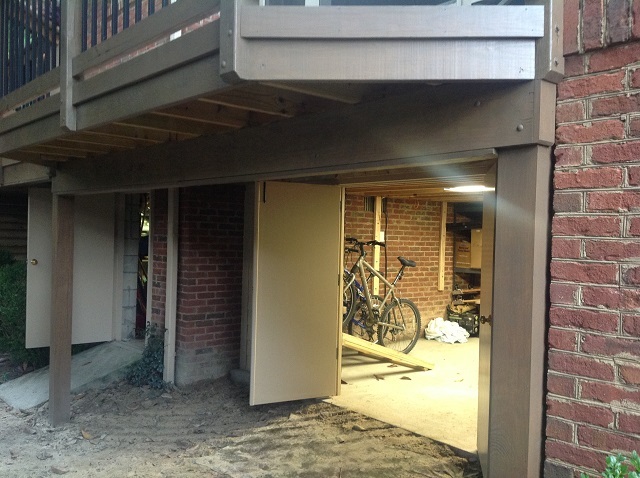 Convenient and spacious dry storage space under the deck. For an existing deck, retro-fit products are the way to go to create an awesome dry deck space that will make the space watertight. These systems operate by integrating a slope to divert precipitation to a gutter for draining, creating a slightly sloped ceiling for your room underneath. 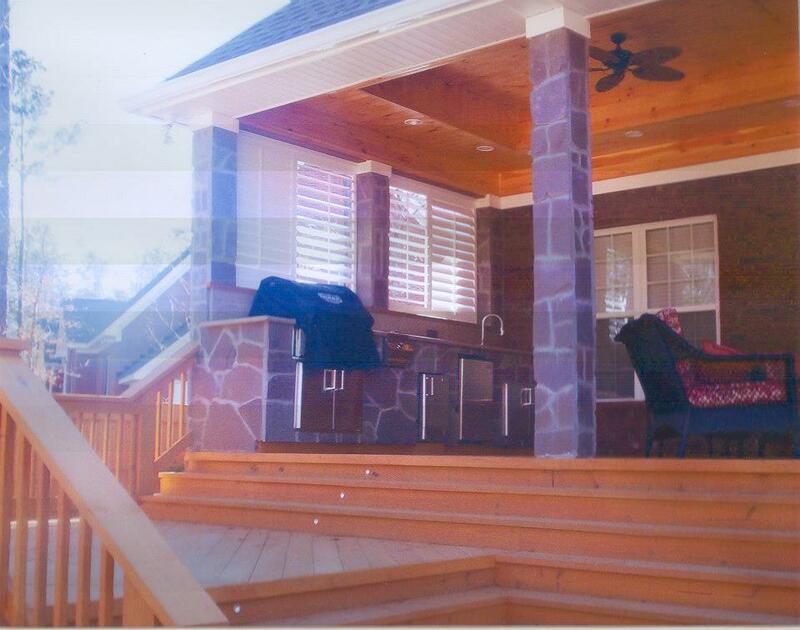 Archadeck of Central South Carolina uses various dry deck systems depending upon the ultimate use of the finished space below your deck. Some of our more popular choices include Drysnap vinyl ceiling panels, which channel the water, and Trex Rain Escape, which is a trough and gutter drainage system; these are just a few of the options available to make the most of the space under your deck. We pride ourselves on making the most out of every bit of outdoor living space you have available to create your ultimate backyard retreat. If you’re thinking of adding a second-story deck onto your home, or currently have an existing second-story deck you wish to finish out the dry deck space beneath, Archadeck of Central South Carolina is your builder of choice. 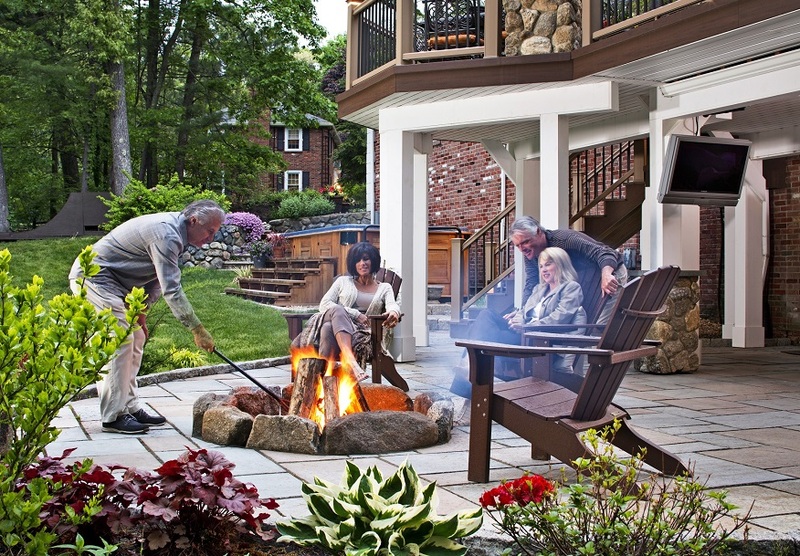 Our award-winning outdoor living combinations are unparalleled in design and quality. Contact us to learn more by calling (803) 603-2160 or email us at centralsc@archadeck.net. This entry was posted in Covered Patios, Custom Outdoor Living Designer & Builder, Deck design, Decks, Dry Deck Space, Outdoor Living, Outdoor living combination structures, Outdoor Rooms, Screened Porches and tagged Archadeck of Central SC, Archadeck of Central South Carolina, Central SC deck builder, Central SC deck designs, Central SC outdoor structure experts, Columbia SC Composite Decks, Columbia SC deck and porch builder, Columbia SC Deck Builder, Columbia SC luxury decks, Columbia SC luxury outdoor living spaces, Columbia SC wooden decks, Dry Deck benefits, Dry Snap, Florence SC deck builder, Florence SC decks, Making your Columbia SC dream backyard a reality, Trex Rainescape on April 2, 2015 by archadeckofcentralsc. 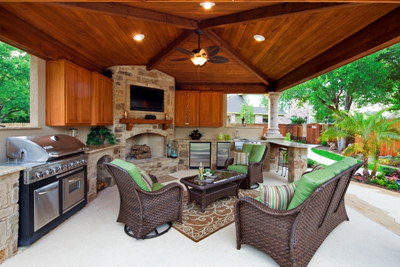 Football season is here — welcome the ultimate “man cave” to your own backyard! This open porch and hardscape combination in Columbia also features an outdoor kitchen for added luxury. This week marks the end of pre-season and the official debut of the 2014 football season. While many residents are anticipating enjoying the games in typical fashion, on the living room sofa, keep in mind that the setting is sometimes just as important as the presentation… With this in mind, score one for the outdoor “man cave” courtesy of Archadeck of Central SC. Ahhh, indeed, the “man cave.” The one place within the home that a man can call his own. 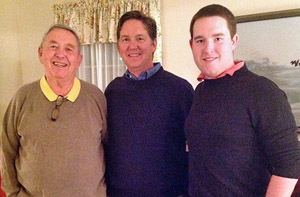 Until recently, “man caves” were just that, cave-like rooms with little style and only basic indulgences: a room containing a couch, a recliner and a television. Nowadays, in the world of custom building, the man cave has earned a new name and reputation, being referred to as “the gentleman’s parlor,” complete with a wet bar, kitchen and custom luxuries fit for a king. We aim to take this kingdom of masculinity one step further by moving the locale into an outdoor structure. 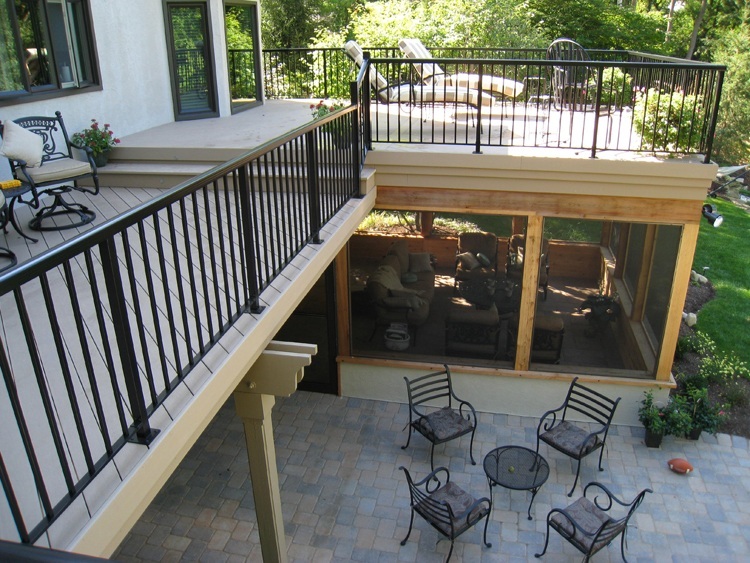 Covered patios, screened porches and outdoor rooms are now being designed with men in mind. No longer will we have to be told to “put a coaster under that; try to keep the noise down; get your feet down.” An outdoor man cave can be designed with all the amenities and accoutrements you will ever want including easy access to tossing around the ol’ pigskin during commercial breaks! I can already smell the combination of leather and testosterone in the air. 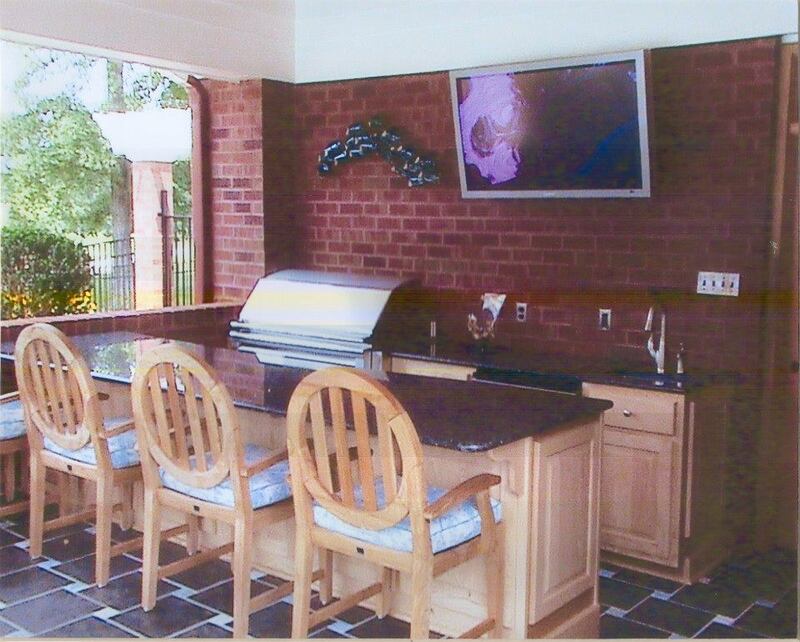 This covered patio space features an outdoor kitchen with bar seating along with a wall mounted TV — GAME ON! Your friends have converged at your home to watch the BIG game on your BIG screen that is mounted on the wall of your covered patio that overlooks the pool and backyard. The game is sounding as realistic as though you were on the 40 yard line. 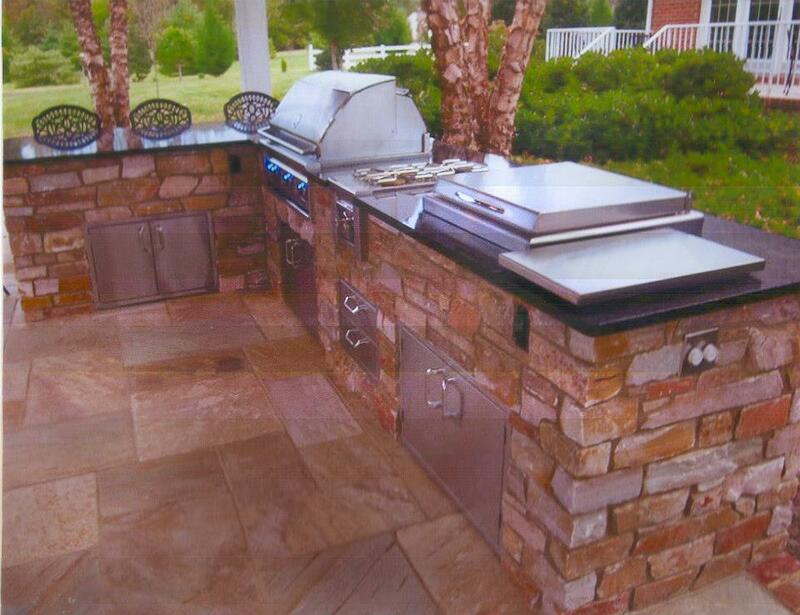 This multi-functional outdoor kitchen features “eat-in” style bar seating. The tantalizing aroma of ribs smoking on the grill of your outdoor kitchen reminds you that half-time isn’t far off. A few friends brought hot dogs to grill, and you have the buns ready in your bun warmer that is designed especially for that purpose. While you wait for the second quarter to start you pour everyone a cold drink from your stocked outdoor bar, complete with a sink and insulated bin for ice. The best part is right before half-time; you are only steps away from gathering in the yard to throw around the pigskin for a while. Having these luxurious conveniences within your man cave turns an afternoon of football into an entertaining and relaxing dream come true where you are just mere feet away from the great outdoors. It doesn’t get any better than this. Columbia, SC, three season room with rustic beadboard ceiling, ample dining and seating areas. Now WAKE UP — and contact Archadeck of Central SC to make the dream a reality. We can can plan, design and build the ultimate outdoor man cave the entire family will love and enjoy! Call today for a free design consultation at (803) 603-2160 or email us at centralsc@archadeck.net. This entry was posted in Covered Patios, Custom Outdoor Living Designer & Builder, Entertaining, Outdoor fun, Outdoor Kitchens, Outdoor Living, Outdoor living combination structures, Outdoor Rooms, Porches and tagged Archadeck of Central SC, Archadeck of Central South Carolina, Central SC combination outdoor living spaces, Central SC outdoor kitchens, Central SC outdoor rooms, Central SC outdoor rooms for enjoying sports, Central SC screened porches, Columbia SC four season room builder, Columbia SC outdoor kitchens, Columbia SC outdoor man caves, Columbia SC outdoor rooms, Columbia SC screened porches, Creative outdoor living space designs for Columbia SC, Creeative outdoor living designs in Central SC, Lexington SC outdoor kitchens, Lexington SC outdoor rooms, Lexington SC screened porches, The perfect outdoor man cave for football season 2014 on August 30, 2014 by archadeckofcentralsc.